RUSTLIN’ UP SOME GRUB. 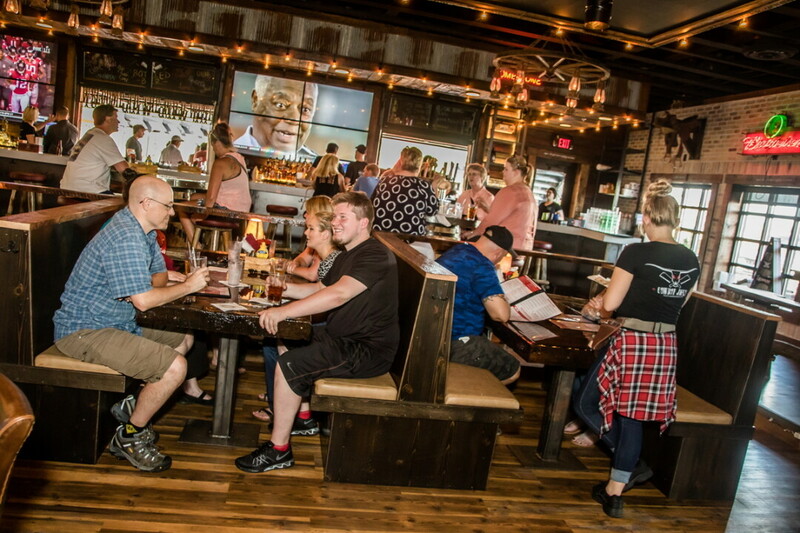 The new Cowboy Jack’s Saloon in Altoona offers outdoor and indoor seating. Got a hankerin’ for some home-style, lip-smackin’ treats? Then throw on your best bib and tucker and head on down to Cowboy Jack’s Saloon. This brand-new addition to the River Prairie Development in Altoona has been quickly gaining popularity for its Western-chic atmosphere. Originally a Twin Cities-based franchise, this location is the first to be built in Wisconsin and the first to be owned by local developers. Nestled on the bank of the Eau Claire River, Cowboy Jack’s offers a backwoods cabin atmosphere that is unrivaled. And the food isn’t so bad, either. Cowboy Jack’s offers an array of American casual grub, including burgers, flatbreads, steak, seafood, and more. Customer favorites include the Blackened Minnesota Walleye or the finger-lickin’ Cowboy Burger. Don’t forget to try one of the homemade dishes – including the signature wild rice soup, tater tot hot dish, and corn bread – which are sure to satisfy the loneliest, hungriest of rangers. Enjoy your meal cozied up near one of three fireplaces, or wet your whistle at the expansive indoor/outdoor bar, which sports a well-rounded selection of whiskey, tequila, and tap or bottled beers. With competitive Happy Hour specials (daily from 3-6pm and 10pm-midnight) and a Bloody Mary bar (Saturdays and Sundays, 11am-1pm), it’s the perfect place for a hootenanny with friends, family, or your pardner. 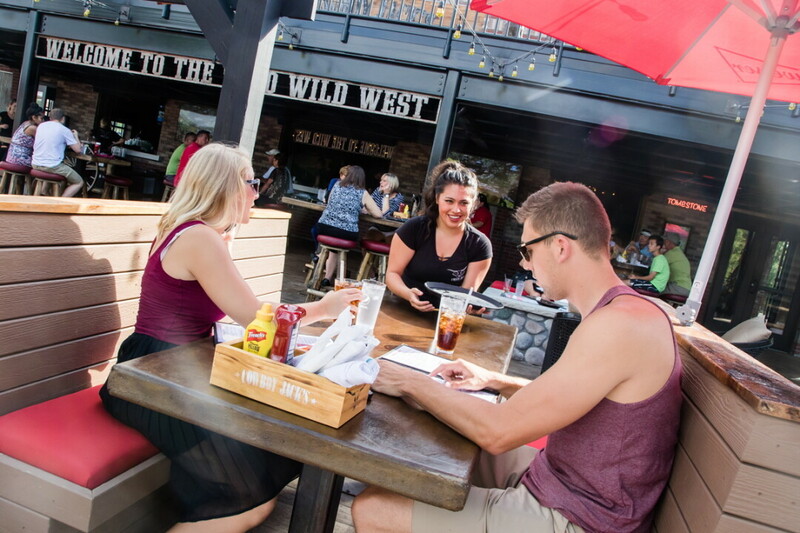 To make things even better, Cowboy Jack’s has one of the largest and most scenic patios (upper and lower decks) that this area has to offer. Yeee-haw! Speaking with general manager Lori Hayden, it’s clear that Cowboy Jack’s is settling in just fine. “We’re getting a lot of positive feedback from the community,” Hayden said. “People love the food and the service. It’s just a cool place to hang out—the patio is a really big draw for people.” But the saloon has more than just great food and a killer patio. “Down the line, we’ll be incorporating live music and other events at the location. We’re looking forward to that,” Hayden shared. In addition a brand new amphitheater is currently being built directly beyond the patio. (Imagine Eau Claire’s Phoenix Park, but a bit more rustic.) This will be a shared space that businesses in River Prairie, such as Cowboy Jack’s and the future River Prairie Event Center, will be able to use alongside community members. With all of this going on, it’s time to pony up and head on over to Cowboy Jack’s Saloon for one heck of a boot stompin’ experience, Stetson and spurs optional.